Los Angeles, CA (obama.net) – After already being sent to prison over one year ago for attempting to illegally purchase machine guns and silencers, it had appeared that Clifford Harris, better known as T.I., had become a changed man with a message of peace to spread. Harris spent time advocating that children stay away from drugs, violence, and all crime. 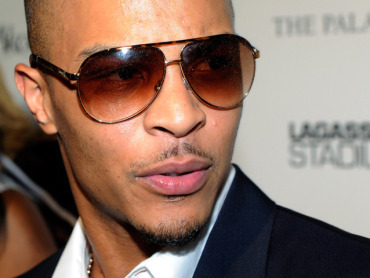 Many had believed that a new T.I. was emerging before their eyes. But then, two months ago in Los Angeles, Harris and his wife Tameka “Tiny” Cottle were stopped on a routine traffic stop. During the procedure, drugs were found in the car. The possession of the drugs violated the terms of Harris’ probation. The rapper was ordered to return to jail within two weeks of the sentencing, which ended up being for 11 months. November 1st was the set date for the rappers’ return to the prison cell. Harris, who was dropped by Axe deodorant and Remy Martin this week, will be serving his 11 months in the same prison where he served his term one year ago in Arkansas. T.I. will not be facing drug charges from the incident as the District Attorney of Los Angeles County has decided not to pursue further charges. During the traffic stop, a total of four ecstasy pills were located on Harris. However, Harris’ wife Cottle was charged with ecstasy possession this past Friday. It has yet to be determined how much prison time Cottle is facing and how likely it is that she would end up having to serve any of the time. As the hip hop community looks on as one of its stars heads off to jail for the second time in two years, disappointment is surely a widespread feeling. Just three days before the release of Grammy Award winner Lil Wayne from prison, the hip hop community says goodbye to another Grammy Award winner for the next 11 months as T.I. sets foot into the Arkansas facility.